The Ruskin Mill Trust’s refurbishment of the ‘New’ Standard Works began with the completion and opening of the Argent College. The Trust has now completed renovation of the ground floor of the building to create a training bakery and cafe that provides valuable work experience and training opportunities to students at the Argent College. Funded by the Greater Birmingham and Solihull Local Enterprise Partnership it offers delicious meals, coffee, cakes and bread to the growing residential and business community within the Quarter. 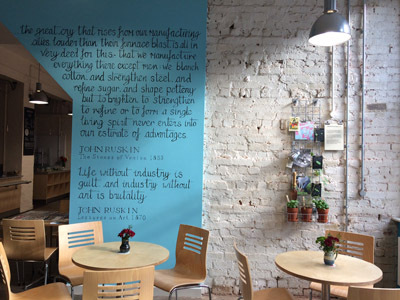 The cafe and bakery is designed to reflect not only the contemporary life in the Quarter, but also honours its history, with quotations, images, peep shows and a mini museum of Birmingham; the first stage of the heritage displays funded by the Heritage Lottery Fund. 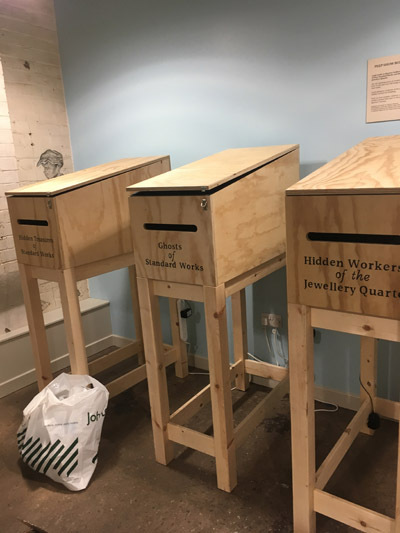 The standing boxes you can see are a modern version of the traditional Peep Show boxes and have short films in about the people and products made in the JQ, and images of Standard Works as it was when Ruskin Mill Trust moved in. The Ruskin Mill Trust state they are enormously grateful to everyone who has supported this phase of the transformation: Greater Birmingham and Solihull Local Enterprise Partnership; Garfield Weston Foundation; Heritage Lottery Fund; Albert Hunt Trust; The 29th May 1961 Charity Sterling Charity; Edward Cadbury Charitable Trust; Charlotte Heber-Percy Charitable Trust. The first stage of transformation is well underway. Led by Argent’s College’s Horticulture Tutor, Matthew Hayes, the roof is now busy producing glorious salads and herbs for the cafe and bakery underneath, and providing valuable gardening experience for the students. The Ruskin Mill Trust are extremely grateful to all the very supportive funders: The Morrison’s Foundation; Ninevah Charitable Trust; Tesco’s Bags of Help; Finnis Scott Foundation; George Henry Collins Trust; The Wisdom Factory; The Edwards and Dorothy Cadbury Trust. The final part of the project is due to start later in the summer.